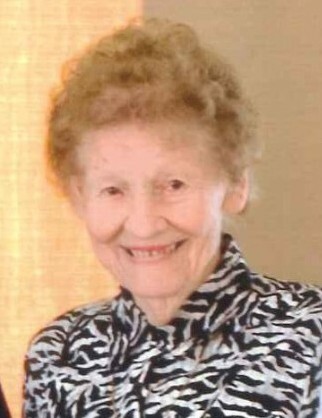 Mary Ann (Shaughnessy) Meyer, age 96 of Belle Plaine, passed away on Wednesday, November 28, 2018 at the Belle Plaine Lutheran Home. Her Funeral Mass will be the Mass of the Immaculate Conception at 10:30 a.m. on Saturday, December 8 at Our Lady of the Prairie Catholic Church in Belle Plaine. Fr. Brian Lynch will officiate the Mass. Visitation will be from 9-10:30 a.m at the church on Saturday. Interment will be in Sts. Peter and Paul Cemetery in Belle Plaine. Mary Ann was born on February 2, 1922 in Jessenland Township to Ray and Veronica (Hensler) Healy. She married Leo Shaughnessy on September 12, 1942. Together they had six children. Robert, Janice, Michael, Patty, Joe, and Lori. Mary Ann enjoyed playing cards with her family and friends, going to the casino, and playing with her best friend Hank, her cat. Mary Ann worked at the Valley View Nursing Home, Plastics Plant, and had many house cleaning jobs. Mary Ann is survived by her son, Michael (Debbie) Shaughnessy; daughter-in-law, Jan Shaughnessy; sons-in-law, Joe (Linda) Fahey, and Josh (Cleo) Karlberg; grandchildren, Melissa (Jeff) Siegle, Cassie (Steve) Gerres, Brent Shaughnessy, Kelly Shaughnessy, Brian Shaughnessy, Tammy Schultz, Tracy (Troy) Witt, Joey (Joanna) Fahey, Chris (Sara) Fahey, Ryan Fahey, Shaun Karlberg, and Katie Karlberg; 23 great-grandchildren; 2 great great-grandchildren; many nieces and nephews; and her cat, Hank. She is preceded in death by her parents; husband, Leo Shaughnessy; sons, Robert and Joe Shaughnessy; daughters, Janice Fahey, Patty Karlberg, and Lori Shaughnessy; sisters, Marie Herrmann, Veronica Traxler, and Margaret McCormick; brothers, Charles “Bud” Healy, and Kenneth Healy.